Emily Nickel is an artist and arts educator who uses human and animal forms to interrogate societal pressures on individual identity. 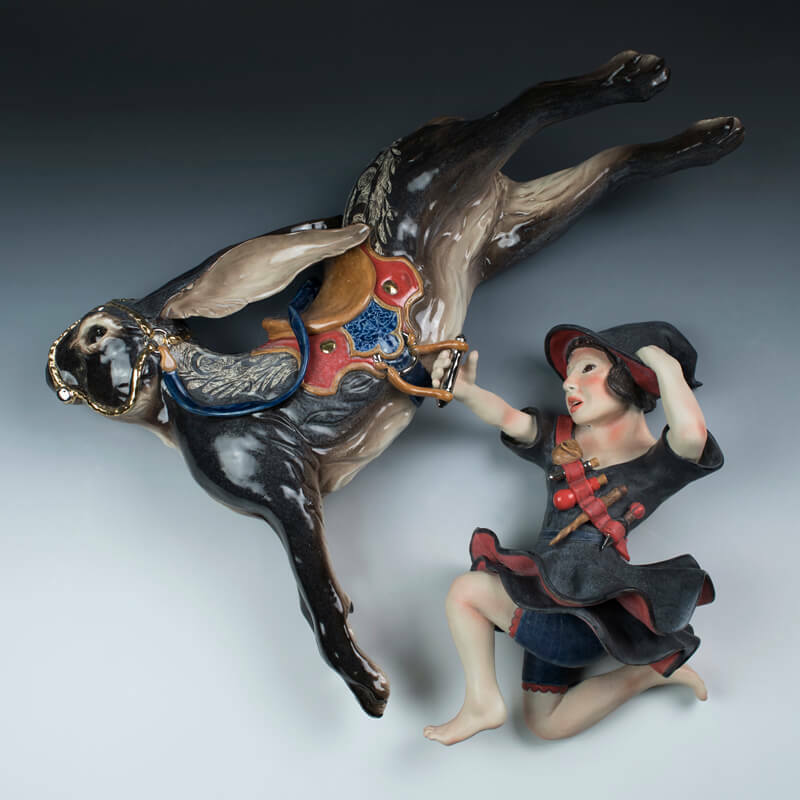 She holds an MFA in Ceramics from Indiana University in Bloomington. Emily’s work has been exhibited throughout the US and internationally, from Baltimore to Montana to Kyoto, Japan, and has received a number of artist’s grants and awards. She has participated in several residency programs including Watershed Center for the Ceramic Arts and Red Lodge Clay Center. I create ceramic figures and vessels featuring magical beasts and their human companions seeking their truth in an unfamiliar world. I’m interested in the myriad ways that young people attempt to find their true selves amidst the pressures of our intensely materialistic society. I set this search for self in a parallel realm from our own: the lush, dreamlike environs common to a literary genre known as Portal Fantasy. I find Portal Fantasy an apt metaphor for growing up: as protagonists are thrust suddenly through a portal into a new world, where nothing makes sense and they don’t know how to fit in. Though these fantasy worlds may be beautiful and full of magic, they also contain challenges to the protagonist’s identity and sense of morality. I lavish detail and imagery upon my pieces to signal that they come from a world such as these. Visually, you will find many references to the Portal Fantasy genre, such as block-print-like illustrations, animal characters, or fantastical landscapes. Often, my characters will tumble, fly, or swim in an indeterminate space, giving a sense of their inner uncertainty.